Dr. Rivard's priority is always the patient. Venous health says so much about our entire bodies general health and your appointment time is just for YOU. The wait in the lobby is usually no longer than 5 minutes. You never feel rushed and can ask questions without worry of running out of time. He realizes patients may have anxiety about seeing a doctor and once you walk into his office you immediately are put at ease by his lobby and his staff. Warm, inviting and a staff that meets you with a smile. After 27+ years in the Emergency room, then going back to school and getting Board Certified, Dr. Rivard's expertise cannot be duplicated. Once he has checked your veins and listened to your history he takes the time to talk you about what he has learned right then and there! Sometimes there is no need to have any procedures, other times you may need to see a doctor in a completely different field, but always he assess your entire body health along with your venous health. He helps you choose the next steps in your treatment. If you are in need of his care, his staff works to set up your appointments, insurance concerns and plans for the next steps needed to get you to your optimal health. 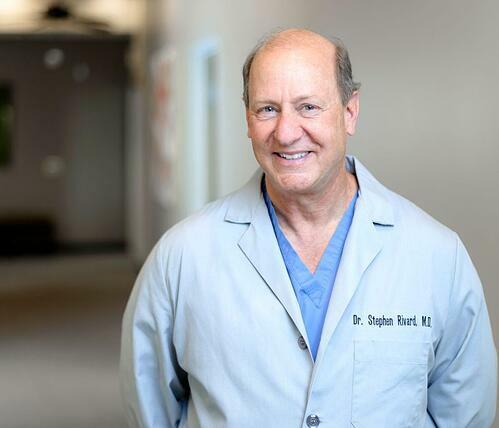 After over 10,000 procedures and 10+ years, Dr. Rivard is the specialist everyone should see for their veins.